Lately there have been lots of posts on faux taxidermy floating around the web. Since I grew up between hippo and impala sculls I have developed both a love and a hatred for taxidermy. On the one hand I love the idea of bringing nature inside. On the other hand I abhor the idea of bringing dead animals inside (especially since I'm a vegetarian). Faux taxidermy could be a solution! I compiled quite an inspirational list for you (and for me). I love this deer from Okgreat, it only seems like a whole lot of knitting work. The fluffyness of the wool and the knitting pattern give the deer a warm and homely feeling. This deer is from someone on Flickr who stuck Brooklyn on a kit from Cardboard Safari. However if you are to cheap to buy cardboard over the internet (like me), Ty from Know and tell crafts has made a downloadable and DIY-able version. Or if you have a laser cutter download this one. I absolutely adore the faux from Anthropologie! I love the way they used typed paper to give an extra dimension to the animal heads. Mandi from Vintage Revivals did a great piece on how to DIY one of those cuties from Anthropologie, definitely worth checking out! I found this inspirational cutie at Apartment Therapy (yes that is one of my favorite websites), they too have a page on faux taxidermy. But this cutie is from Etsy and no longer available. 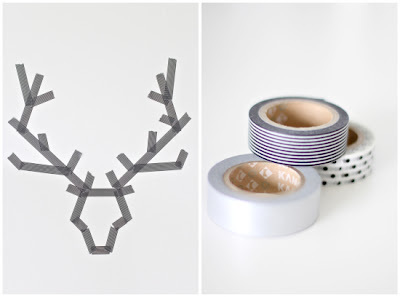 For something pretty and simple and very DIY-able look at these Antlers with Japanese tape from Stylizimo blog. There are so many fun things to do with faux taxidermy! I'm sure you can come up with lots more fun projects! I'm looking forward to seeing them on your blogs and comments! thanks doll ;) cute blog!